Roll up! Roll up! For the Battle of the century! 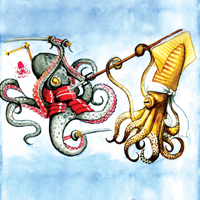 The Battle of the Cephalopods. This interactive presentation seeks to discover which cephalopod is best: the octopus, the cuttlefish, the squid or the nautilus. Each contender is championed by their allocated expert including cuttlefish connoisseur Jay Culligan, squid specialist Simon Watt (from TV’s ‘Inside Nature’s Giants’), nautilus know-it-all Kerry Perkins, and octopus orator Russell Arnott. Six squid. Includes entry into Brighton SEA LIFE Centre.